All the diving off Sea Safari 8 is done using tender boats. “can we check out some muck-sites?” was a question our dive-guide Andi had not expected. It was so unexpected because we were diving the heart of the Coral Triangle at Raja Ampat in eastern Indonesia, an area where everyone comes to admire the magnificent corals and impressive schools of fish. Raja Ampat, located in the Indonesian province of West Papua, has the greatest diversity of corals and fish on the planet, and had been a dream destination of ours for many years. We finally got to explore this rich marine eco-system in May, joining the liveaboard Sea Safari 8 for a 10-day itinerary. This 35m traditional-style phinisi schooner was the perfect platform to explore this remote region, with its comfortable en-suite cabins, a great crew, superb food and plenty of bench space to allow underwater photographers to tinker with their toys. Departing from the port city of Sorong, we headed south overnight to the Misool area and, from the very first dive, were stunned by the beauty of the reefs and the sheer volume of fish. Like other photographers who have visited this region we stuck with our wide-angle lens over the first few days as we explored sea-mounts, walls and coral gardens at sites such as Candy Store, Andiamo, Karang Bayangan, Boo Window and Four Kings. At each of these sites we found the terrain decorated with gorgonians, whip corals, soft corals, sea whips, black coral trees and sponges. The fish life was even more impressive, not only the variety of fish species but the dense schools of reef and pelagic fish. For each dive-briefing Andi had said he would put a symbol on the whiteboard as a tip for photographic subjects – M from macro and W for wide-angle. He might as well have used a permanent marker, because it was always W. Under water, however, things were a little different. from the first dive Andi was pointing out just as many small critters as big ones. However, with our wide-angle lens and so many colourful corals and schooling fish to photograph, we simply ignored these macro subjects. At the end of day three, Andi put a W and an M on the whiteboard against the dive-site Nudi Rock. We were going to stick with the wide-angle until Andi mentioned that this was a great spot for Santa Claus pygmy seahorses, which are found only in Raja Ampat. 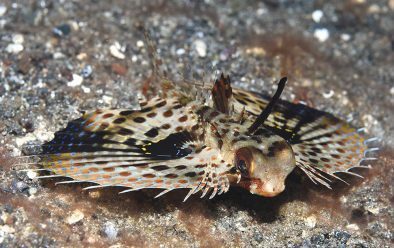 The sandy slope at Bethlehem 2 was home to a number of oriental sea robins. It was finally time to put the wide-angle away and look at the smaller critters of this area. It was good to slow down and start looking at the small stuff that we had been ignoring. We soon realised that Andi had an encyclopaedic knowledge of local marine life and was pointing out small fish that were endemic to this region. He carried a small slate and was continuously writing down the names of unique dottybacks, damsels and blennies. We would have easily overlooked these species if not for Andi. 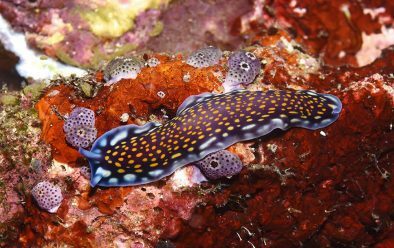 Nudi Rock didn’t have many nudibranchs, but what it did have was a smorgasbord of small reef fish. With a passion for fish portraits, we were in our element photographing varieties of angelfish, basslets, butterflyfish, blennies and dragonets, including a surprising number of juveniles. Andi also found us a Santa Claus pygmy seahorse, but this one was very shy and near-impossible to photograph. Hoping for some wonderful macro subjects at night, we were a little disappointed by the nocturnal life in the Misool area on the sites we dived. Both Camel Rock and Pantai Kecil were wall-dives, which can be a little hit and miss in the dark. We did see sleeping fish, a couple of moray eels and a variety of crabs and shrimps, but nothing really special. However, on day four we enjoyed another fabulous macro-dive at a site called Anchovy. This was another site that was a toss-up between wide and macro, but we were glad we went with macro because there were nudibranchs, flatworms, dottybacks, blennies, anemonefish, pygmy seahorses and many more subjects to photograph. It was after this dive that we asked about the possibility of some muck-diving. while researching my recent book Muck Diving we discovered that there were a few good muck-sites in Raja Ampat but that they were rarely visited. Andi was keen, because he and the other dive-guides had done little muck-diving in the area. And fortunately the other divers, mostly keen photographers, were also happy with this little detour. Andi revised the itinerary so that we could spend the next day at Batanta on our way north to the Dampier Strait. Arriving off the southern side of Batanta, it was pretty evident from the black-sand beaches that this area was perfect for muck-diving. The first dive at Algae Patch 2 was just like being in Lembeh, a slope of dark sand but, unlike Lembeh, no rubbish. We quickly found shrimp gobies, nudibranchs, pipefish, dragonets, mantis shrimps, lionfish, waspfish, scorpionfish and a long-arm octopus. Numerous sea-pens sprouted from the sand, and some were home to porcelain crabs and commensal shrimps. We also spotted numerous sea anemones populated with panda anemonefish, and most were enthusiastically guarding eggs. Andi also pointed out two endemic species, the Batanta dottyback and a group of lyre-tail fire gobies. The other muck-sites, at Bethlehem, Algae Patch 1 and Bethlehem 2, were a mixture of sand, rubble and patches of coral gardens. At these sites the muck-critters were a little harder to find, with the highlight being the wide variety of small fish. We found cowfish, jawfish, oriental sea robins, soles, lionfish, grubfish, dottybacks, gobies, damsels, blennies and small angelfish – but the standout were the flasher wrasse. Andi had attempted to point out these small, colourful fish at a few sites in Misool, but with so much coral and fish about they hadn’t stood out from the crowd. In this muck environment it was much easier to observe them. At first they didn’t look much different from other wrasse – but then we witnessed the males fanning out their fins to flash their brilliant colours. They were much too fast for our cameras, so we gave up on photography and simply watched the performance. The muck-dives at Batanta were very enjoyable, and while we didn’t see as many critters as at other famous muck-sites, we could see the potential for the area. Andi also informed us that there were other good muck-sites on the northern side of the island. We would have loved to do a night-dive at one of these sites, but instead we had an overnight trip ahead to reach the Dampier Strait. over the next four days we had some incredible dives in this area, encountering manta rays at Manta Ridge and Manta Sandy, and some of the greatest concentrations of fish life we have ever seen at Sawandarek Jetty, Cape Kri, Mioskon Island and Blue Magic. The wide-angle lens got a real work-out in this area, but on all of these dives we could just as easily have gone with a macro lens, because these sites were also home to pygmy seahorses, mushroom-coral pipefish, ghost pipefish, leaf scorpionfish and a host of other small critters. We did get the macro lens out on two day dives, finally getting the Santa Claus pygmy seahorse at Keruo Channel and a great collection of juvenile fish at Friwenbonda Reef. But it was the night-dives in this area where the macro lens came into its own. The big difference between the night-dives in this area and Misool was rubble. All the sites we explored had coral rubble under which nocturnal critters could hide. At Galaxy Jetty we found octopus, ghost pipefish, moray eels, hermit crabs, spider crabs and a huge sea hare, while at Friwenbonda Reef it was cuttlefish, slipper lobsters, decorator crabs and several Raja Ampat epaulette sharks. But best of all was Yenbuba jetty. Exploring the rubble slope in front of it, Andi excelled himself when he found a banded toadfish only minutes into the dive. This was the first time we had seen this species, as these shy fish are rarely seen in Asia. Next up was a pair of sea-cucumber swimming crabs on a sea cucumber, quickly followed by a reef octopus. Over the 70-minute dive we saw a wonderful array of crustaceans, hunting moray eels and a sleeping hawksbill. Andi ended this magic dive by locating a Halimeda and a robust ghost pipefish hovering together among the rubble, and then a pair of Pontohi pygmy seahorses. 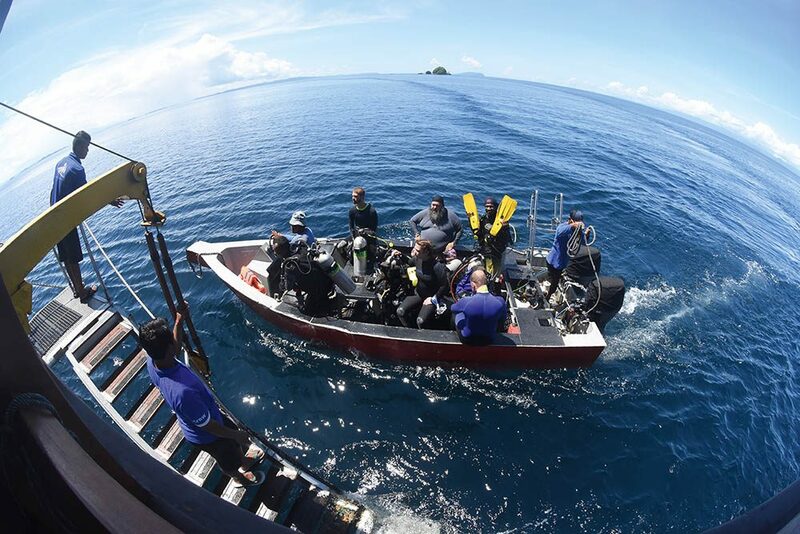 Our eight days of diving the rich waters of Raja Ampat ended all too quickly. On the sail back to Sorong we reflected on this incredible destination, and can well understand why it is a mecca for wide-angle photographers. However, with a great assortment of smaller critters as well, Raja Ampat is a wonderful destination for all creatures great and small. GETTING THERE> Fly from the UK to Jakarta. A number of domestic airlines offer daily flights from Jakarta or Denpasar, Bali, to Sorong, most with a stopover in Makassar. Liveaboards exploring Raja Ampat depart from Sorong. WHEN TO GO> It’s possible to dive Raja Ampat year-round but most liveaboards operate from October to May, when the seas are calm. Water temperature is in the 28-30°C range and most divers use a 3mm wetsuit. Currents are common and dives are planned according to the tides. Visibility can vary from 12-30m-plus. 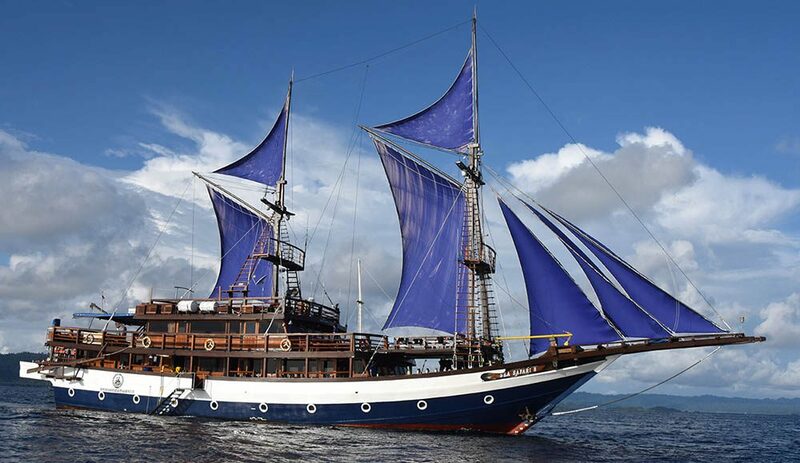 PRICES> berth aboard Sea Safari 8 costs from $450pp a night including all meals plus $100pp per two dives. Return flights from London to Sorong from £700.